Stations: As a Cadet: Modus Operandi Section, the Traffic Room 6 Division ( North Sydney ), Station Duty 25 Division ( Chatswood ) and the Coroners Court before returning to the Police Academy as a Trainee in January 1980. As a Sworn Policeman: 25 Division G.D’s & Beats ( Chatswood ), Queanbeyan ( August 1981 – 1984 ), Armidale ( 1984 – 1987 ), Port Macquarie CIB & SWOS ( 1987 – 1995 ), Katoomba G.D’s ( 1995 – 1999 ), St Marys LAC – Duty Officer ( 1999 – 2003 ), Hawkesbury LAC & Commander ( 9 March 2003 – 2008 ), Blue Mountains LAC & Commander ( 2008 – 25 October 2012 ) – Retirement. Clasp to Australian Police Medal – granted ? ? ? Commissioner’s Commendation for Service – granted ? ? ? There is a saying that,”All good things must come to an end”. The police cadet scheme was no exception and, eventually, succumbed to this adage. The intake of July 1977 was the last group of youths recruited to become Police Cadets. Many reasons can be advanced as causing this state of affairs: the demise of apprenticeships in society generally; the success of the Wyndham Scheme which added an extra year to high school attendance thus robbing the cadet scheme of potential recruits aged 15 and 16 years of age; the growing trend of high school students to continue their education to obtain the Higher School Certificate, together with the desire to obtain a university education. On 7 July 1980, Commissioner James Travers Lees, who was a former cadet, administered the oath of office to Cadet Anthony James McWhirter, who then became a Probationary Constable in the Police Force. With that ceremony completed, there were no more cadets and the scheme, which had commenced in June 1933, some 47 years earlier, ceased to exist. Five retiring police officers will be ‘marched off’ the parade ground at the Goulburn Police Academy today after a combined 150 years’ service with NSW Police Force. NSW Police Force Commissioner Andrew Scipione will pay tribute to the remarkable careers of Assistant Commissioner Paul Carey, Detective Superintendent Terence Dalton, Superintendent Michael Kenny, Superintendent Anthony McWhirter and Inspector Edward Billett. “The service provided to our state by these retiring officers cannot be measured. They have been dedicated and have served our communities during their remarkable careers,” Commissioner Scipione said. “Today their dedicated service will be recognised on this parade ground by their colleagues, family and friends,” he said. Assistant Commissioner Paul Carey joined the NSW Police on the 26 February 1973 and was sworn in as a probationary constable on 1 April 1973, where he started work at Central Police Station. A year later in November 1974, he was transferred to No.22 Division at Liverpool and Green Valley Police Stations to work both in General Duties and as a Rescue Operator. In 1980 he transferred to Wollongong Police Station where he remained for 10 years performing general duties and licensing. In 1990 Mr Carey transferred to the Police Headquarters and performed a number of program and policy development roles until 1994. During 1995, he relieved as the Chief of Staff to Deputy Commissioners and the Commissioner. In 1996 he became the Patrol Commander at Manly and the following year became the Local Area Commander at St Marys until his transfer to Kogarah in 1999. Mr Carey was appointed as the Local Area Commander of City Central in 2003 and performed these duties for four years until 2007. During his time at City Central Mr Carey was the Operational Commander for numerous major public demonstrations, public protests and community celebrations including: ANZAC Day; New Years Eve; dignitary visits; APEC; and, the Harbour Bridge 75th Anniversary. In 2008, Mr Carey was promoted to the rank of Assistant Commissioner and the Commander of Professional Standards, a position he has held until his retirement today. Mr Carey is a qualified Counter Terrorism Commander, a senior Operational Commander and has represented the NSW Police Force at a number of national and international conferences. He retires today (Friday 14 December 2012), on his 60th birthday, after 39 years and 10 months of service in the NSW Police Force. Detective Superintendent Terence Charles Calov Dalton APM attested into the NSW Police Force on 5 February 1982. He had previously served in the Tasmanian Police and Royal Hong Kong Police. His first role in NSW was performing general duties at Gosford and Waverley and then criminal investigation duties at No.10 Division. He also worked in the roles of Superintendent of Licences; Police Internal Affairs Branch; Special Branch (VIP Protection); at Campsie Local Area Command; the Major Crime Squad South; Crime Agencies; and, City Central Police. Between 1989 and 2000, Mr Dalton performed the duty of a negotiator with SWOS and SPG. On 20 May 2000 Mr Dalton was promoted to the rank of Detective Inspector and appointed as the Crime Manager of Rose Bay Local Area Command. In December 2002, he was again promoted to the rank of Superintendent and appointed as the Commander of the NSW Marine Area Command. During this time he was instrumental in conducting major reform and developing greater capability at the command. Mr Dalton then worked as Commander of North Shore Local Area Command which he undertook from January 2008 until December 2011. Mr Dalton is a recipient of the National Medal and 1st Clasp to the medal. He is also the recipient of the NSW Police Medal and 3rd Clasp to that medal. He was awarded the Centenary Medal in 2001 for service to policing in the community and is the recipient of the Australian Police Medal for distinguished service in the 2010 Queen’s Birthday Honours List. Mr Dalton was awarded the Commissioner’s Unit Citation in 2003 in recognition of outstanding work demonstrated during the pursuit and interception of North Korean vessel MV Pong Su. Detective Superintendent Dalton retired from the NSW Police Force on 29 September 2012. He was the Director of the 150th Anniversary of Policing Project and it is fitting he is recognised in this 150th year of policing in NSW. Superintendent Michael Kenny joined the NSW Police Force as a trainee on 11 January 1982 and was attested as a Probationary Constable on 2 April 1982. His early service was as a general duties officer at Chatswood and Lane Cove patrols, and then in tactical policing with the Tactical Response Group and State Protect Group Operations Unit. In the early 1990’s, Mr Kenny worked as an investigator and training officer with Internal Affairs before transferring to Armidale as the Education Officer where he was promoted to the rank of Sergeant in 1996. He then transferred to Kempsey to perform the role of a general duties supervisor. Mr Kenny was promoted to the rank of Inspector on 28 October 1999 and worked as a Duty Officer at Waratah Local Area Command, before becoming Commander of Scarce Resources for the Hunter Region, leading the Target Action Group, Anti-Theft Unit and Transit Units. Mr Kenny was promoted to the rank of Superintendent on 18 November 2002 and appointed as the Local Area Commander at Lake Macquarie where he worked for three years. In 2006 he was transferred to Tweed Byron Local Area Command where he worked for four and a half years, before being transferred to his current duties as Commander of Kuring-gai Local Area Command in 2010. Over his 30 year career, Mr Kenny has been recognised and was awarded the National Medal in 1997, NSW Police Medal and 2nd Clasp to the NSW Police Medal in 2005, 1st Clasp to the National Medal in 2008 and 3rd Clasp to the NSW Police Medal in 2009. Commander Kenny was awarded the Rotary Club of Newcastle Award in 2002 in recognition of his outstanding policing service to the community of Newcastle during 2001-2002. Superintendent Kenny retired from the NSW Police Force on 8 November 2012 after 30 years of dedicated service in the NSW Police Force and to the people of NSW. Superintendent Anthony (Tony) McWhirter APM was 15-years-old when he first joined the NSW Police Force as a cadet on 4 July 1977. He initially worked in the metropolitan area at the Modus Operandi Section, the Traffic Room at No.6 Division, Station Duty with No.25 division and the Coroners Court before returning to the Police Academy as a Trainee in January 1980. Mr McWhirter officially became the last NSW Police Cadet when he attested as a probationary constable in July 1980 following the conclusion of cadet enlistments. He worked as a general duties constable and beat policing in No. 25 Division at Chatswood. 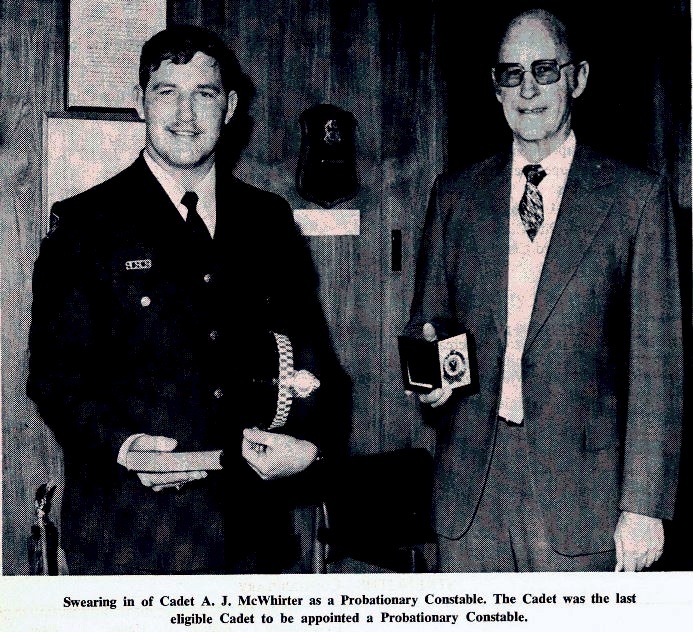 In August 1981, he transferred to Queanbeyan Police Station and in 1984 to investigations at Armidale, and was awarded the designation of detective in 1986. Between 1987 and 1995 Mr McWhirter was attached to criminal investigations in Port Macquarie and also performed duties as an operative with the Special Weapons Operation Squad. On 15 August 1995, he was promoted to the rank of Sergeant and worked at Katoomba as a general duties supervisor. On 13 November 1999 Mr McWhirter was promoted to the rank of Inspector and worked as a duty officer at St Marys Local Area Command. On 9 March 2003 Mr McWhirter was promoted to the rank of Superintendent and Commander of Hawkesbury Local Area Command. In 2008 he became the Commander of Blue Mountains Local Area Command where he served until his retirement. During his 35 years of service in NSW, Mr McWhirter was awarded the Australian Police Medal, the National Medal with first Clasp, the NSW Police Medal and subsequent Clasps, and a Commissioner’s Commendation for Service. Superintendent McWhirter retired from the NSW Police Force on 25 October 2012. Inspector Edward Billett APM, joined the NSW Police Force on 17 February 1969 as a police cadet, graduating on 30 September 1971. He was sworn in as a probationary constable on 1 October 1971 and performed general duties at No.9 Division. In 1973 Mr Billett transferred to No.20 Division Police Transport Section and remained there until October 1975. He then transferred to General Duties at No.32 and No.1 Division. On 27 May 1979, Mr Billett transferred to the Police Prosecuting Branch where he remained until July 1995. Between July 1995 and June 1997, Mr Billett worked as a Senior Sergeant Patrol Tactician at Lakemba Patrol. On 1 July 1997, Mr Billett transferred to Marrickville Local Area Command and relieved as a Duty Officer before becoming an Inspector and Duty Officer in 1999. Mr Billett remained at Marrickville Local Area Command until his retirement on 11 October 2012. During his service he was awarded the National Medal and Ist and 2nd Clasps, the 6th Clasp to the NSW Police Medal and National Police Service Medal. On 13 June 2011, Mr Billett was awarded the Australian Police Medal for distinguished service in the 2011 Queen’s Birthday Honours List. Inspector Billett retired from the NSW Police Force on 11 October 2012. 1933, the Metropolitan Superintendent, William John MacKay, who later became the Commissioner of Police, introduced a system of Police Cadets as part of the New South Wales Police Department. The innovation was not immediately popular with members of the Force because it was feared that cadets would become a “select group” of potential officers, similar to cadets training in selective schools of the Armed Services. When it was established, however, that the only material advantage to cadets would be sectional clerical experience and extended long service leave benefits the system was accepted and finally approved. On June 12, 1933, twelve Police Cadets, the sons of serving Policemen, were appointed to the Police Force and attached to various sections and metropolitan city stations. The Cadets were an immediate success and on 19 October of that year, an additional 18 Cadets were recruited. Of this intake, only a few were sons of Policemen. The rate of pay was £2 weekly. The first of the intake of original Cadets was sworn in during 1936, and by 1962, many of them were serving as Sergeants and Detective Sergeants in important sectional positions. Since 1933 and up until 1962, over 1,700 Cadets had been enrolled in the Police Service. The working conditions of Police Cadets improved greatly over the first two decades and by 1962 all Police Cadets received training in Statute Law, Police Procedure, Police Practice and Duties, English, Shorthand, Speech Culture, Physical Training, Squad Drill, and all sporting pursuits. A select few also attended a course of wireless instruction at the Marconi School of Wireless. In November 1956 it was decided to place police Cadets, in uniform very similar to that worn by police but with a distinctive cap band, on selected school crossings to alleviate the work of traffic police. This immediately raised the ire of the Executive Committee of the police union, the NSW Police Association. The Committee voiced objections to the Commissioner of the day, Colin Delaney, which were based not only on protecting police duties but also because of the risks cadets might face. There was the lack of protection from legal liability, the tenuous situation if they were injured and a fear that cadets would be used in traffic control. The Commissioner was unmoved and the scheme was introduced. The following school holidays saw the Association’s fears realised. With no school crossings to supervise, the uniformed cadets were deployed to assist police in the City of Sydney to assist control the vast crowds of Christmas shoppers who flocked to the metropolis. A compromise was reached when representations to the Premier, JJ Cahill, resulted in those uniformed cadets reverting to plain clothes during school holidays. In 1962 enrolment in the Police Cadet Service was open to youths between the ages of 15 and 18 years who were of excellent character, weighed approximately 10st. 7lbs., measured not less than 5ft. 8 1/2in. in height, educated to a higher primary or secondary school standard and were of such physical proportions as to reasonably indicate that upon attaining the age of 19 years they would fulfil all physical requirements for appointment to the Police Force. As young men they could now be appointed to the Police Force at the age of 19 years, but it was not the practice to accept applications for cadet appointment from youths above the age of 17 1/2 years unless the applicant was in the possession of outstanding qualifications. The object of the Cadet Service was to keep Cadets mentally and physically alert, and to embody in their training a high standard of discipline, dress, and bearing. The tutorial syllabus was designed to prepare Cadets for their future training as Probationary Constables, and to assimilate the fundamental principles of Statute Law, and the necessity of a basic understanding of human relations. At the age of 18 years selected Cadets were assigned to duty at selected school crossings in Cadet uniform. In 1962 Police Cadets effectively controlled 30 school crossings, relieving Traffic Police for more pressing and important road patrol duties. During the period of training all Police Cadets were required to participate in the “Silver Baton Award” competition, which was awarded annually to the Cadet attaining the highest marks in the full training curriculum and syllabus of studies. All Cadets in the Public Speaking Class were required to participate in the annual “Mervyn Finlay Prepared Speech Competition”, for which the winner received a handsome trophy. At the commencement of the Cadet system in 1933 it was the practice for Cadets to attend approved Business Colleges in their own time and at their own expense for instruction in typing and shorthand. In 1938 shorthand classes were inaugurated at the Criminal Investigation Branch under the direction of qualified Police Instructors. Attendance at these classes was on a voluntary basis. In 1940, at the instigation of Commissioner of Police, William J MacKay, daily shorthand instructional classes were officially included in the syllabus of studies for all Cadets. In 1962 Cadets entering the service were required to study shorthand and enter into a departmental contract to write shorthand at a speed ranging from 100 to 120 words per minute at a specified period of their training. Cadets studying the theory of shorthand were required to attend an approved business collage at their own expense. In addition to attending daily courses at the Police Training Centre. Upon graduation from the theory class Cadets terminated private tuition and then received instruction in the Low and High Speed classes conducted four mornings weekly, until they could attain their contract rate. Up until 1962 and since the inauguration of the system over 1,700 Cadets have received shorthand tuition. All had attained speeds of 120 words per minute, and 5%, had achieved speeds in excess of 150 words per minute, the qualifying standard for appointment as official departmental shorthand writers. The use of shorthand proved of inestimable value to Cadets when later appointed Probationary Constables, in the recording of wireless and telephone messages and the taking of statements at accident and various crime scenes. A large number of ex-Cadets were utilised in the offices of country Superintendents and Inspectors as clerks, whilst twelve high speed writers were permanently employed at Police Headquarters on special investigations and departmental conferences. In 1962 all Commonwealth Police organisations had adopted the New South Wales Police Cadet training system. Strangely enough, the cadet system, based on Sydney methods, was not introduced into the London Metropolitan Police Force until 1951. It is now firmly established in that world-famous organisation and it is anticipated that Cadets will soon constitute one-half of the intake of new trainees. The Police Cadet Service proved an outstanding success and a vital acquisition to the New South Wales Police Force in suitably preparing young men for a qualified and an efficient approach to Police procedure, and the manifold responsibilities and difficulties of their chosen career. no means a small task. In this regard I would be lacking if I did not place on record my gratitude for the loyalty and assistance given me by Mr R. E. Whitelaw, my Senior Assistant Commissioner. Assistant Commissioners J. J. E. Black, W. A. R. Allen, C. R. Abbott, M. Kelly, W. R. Ross, R. M. Holloway and former Assistant Commissioners K. C. Jensen and B. D. Taylor who retired during the year. I am no less mindful of the dedication and efficiency displayed, at times under the most trying of conditions, by members of the Force of all ranks in discharging their heavy onus of service to the community at large. On the administrative side of the Department my thanks go to Mr P. A. Bowmer, Secretary, and all Public Service staff under his control for the competent manner in which they carried out their duties. I would be remiss if I did not take this opportunity of expressing my appreciation to my Minister and his staff, for the support and consideration shown to me and the Police Department. Likewise I value the assistance and co-operation of other Ministers, Members of Parliament, heads and representatives of various Government authorities, private organizations, the media and the countless public spirited citizens, who in so many ways have given of their support. The year also saw additional responsibilities placed upon the position of Commissioner. Early in 1980, the State Emergency Services and Civil Defence Act and the Police Regulation Act were amended and under the provisions of the amended legislation I took over the responsibilities of the Director, State Emergency Services and Civil Defence. Because of the complexities of that role an additional position of Assistant Commissioner of Police was created to assist me in the general administration of the organization. Assistant Commissioner Kelly was selected and although it could be described as an area unfamiliar to the normal Police environment, his experience and knowledge has enabled the Assistant Commissioner to carry out the duties required of him in his new position in a most capable manner. I commenced my association with the New South Wales Police Force in 1936 when I was appointed as a Police Cadet. I make mention of this only because 1980 somewhat marked the end of an era with the swearing in of the last eligible Police Cadet. This notable event occurred on 7th July, 1980, when Cadet Anthony James McWhirter attended my Office and was attested as a Probationary Constable. In general and as in the past, the year imposed ever increasing demands on the resources of the Department in the areas of crime, traffic and general Police work. I am proud to say that the men and women under my control met those demands in a very loyal and efficient manner. I have much pleasure in presenting the Police Department’s Annual Report for the year 1980. THREE police officers – one from Orana (Dubbo) Local Area Command (LAC) and two from the Blue Mountains – are among 18 policemen who will support law enforcement officers in Texas by joining a motorcycle ride in remembrance of colleagues who have died in the line of duty. Superintendent Stan Single, Orana LAC, and Superintendent Anthony McWhirter and Inspector Michael Bostock, Blue Mountains LAC, will ride with a contingent of 18 officers from across New South Wales who left Sydney today (Monday) headed for Austin, Texas, to join the Combined Law Enforcement Agencies of Texas in the 11th annual Ride for the Fallen. The main ride will be held in Austin next Saturday, May 5, with daily rides taking place across Texas until Friday, May 11. The NSW Police Force was invited to take part in the ride following the success of last September’s Wall to Wall Ride for Remembrance, which was inspired by the Texas ride. Like the Wall to Wall Ride for Remembrance, the Ride for the Fallen honours officers killed in the line of duty, and raises money for the Peace Officers Memorial Foundation, which perpetuates the memory of law enforcement officers who have made the ultimate sacrifice while protecting the citizens of Texas. NSW Police Deputy Commissioner, Catherine Burn, says participating in the Texas ride is a great honour for the officers involved. “It is wonderful for the officers who work tirelessly to organise the Wall to Wall Ride for Remembrance to experience the ride that inspired our event,” Deputy Commissioner Burn says in a statement. Australian participants in the Texas ride are self-funding the trip, with assistance from the Police Credit Union and the Police Association of NSW, and will raise funds for Police Legacy in Australia. “We are always aiming to raise as much money as possible, but we are determined to beat our targets as we celebrate 150 years of policing in NSW,” he says. NSW Police will provide updates on the Ride for the Fallen on Facebook at: www.facebook.com/nswpoliceforce. Further information on the Wall to Wall Ride for Remembrance at the official website www.walltowallride.com.